Abundance ratios of heavy elements observed in HD 51959 (star symbol), HD 88035 (solid tringle) and HD 121447 (solid hexagon) with respect to metallicity [Fe/H]. Solid circles represent Ba stars from literature (Allen and Barbuy (2006), Liang et al. (2003), Smiljanic et al. (2007), Zacs (1994), de Castro et al. (2016) and Mahanta et al. (2016)). Solid squares represent normal giants from literature (Van der Swaelman et al. (2016), Tautvaisiene et al. (2000) and Luck and Heiter (2007)). Open circles indicate CH stars from Karinkuzhi & Goswami (2014, 2015). Credit: Karinkuzhi et al., 2018. Researchers have carried out a chemical abundance analysis of three chemically peculiar stars, HD 51959, HD 88035 and HD 121447. The research, based on spectroscopic data acquired by the Fiber-fed Extended Range Optical Spectrograph (FEROS), finds that the three objects are nitrogen-enhanced barium stars. The results were presented February 5 in a paper published on arXiv pre-print server. Chemically peculiar stars are those with unusual metal abundances, thus exhibiting strong or weak spectral lines for certain elements. They can be divided into various types based on their chemical composition. For instance, one type known as CH stars can be characterized by the presence of exceedingly strong absorption bands due to CH (methylidyne) in their spectra. HD 51959, HD 88035 and HD 121447, which were the subject of a recent study, were initially classified in 1996 as CH stars. However, the new research conducted by a group of scientists led by Drisya Karinkuzhi of the Indian Institute of Astrophysics in Bangalore, India, reveals more insights into chemical composition of these three peculiar stars. Karinkuzhi's team has obtained high-resolution spectra of the three stars using the FEROS spectrograph installed on the ESO 1.52-m telescope in Chile. This instrument allowed the researchers to carry out an abundance analysis of more than 20 elements in these objects. The results indicate that all the three studied stars should be reclassified to nitrogen-enhanced barium stars. 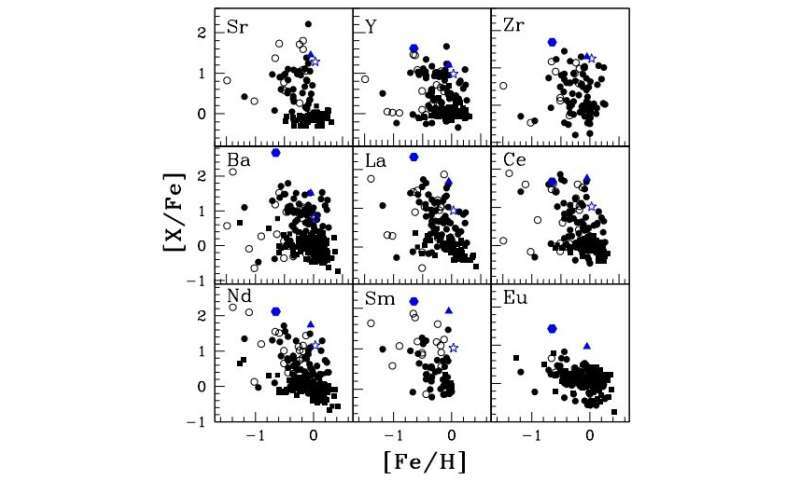 "The heavy elements abundance ratios observed in the three stars match closely with majority of barium stars in literature," the authors wrote in the paper. According to the study, HD 51959 seems to be a mild barium star, HD 88035 a strong barium star, and HD 121447 a metal-poor barium star. The barium to iron ratios [Ba/Fe] for HD 51959, HD 88035 and HD 121447 are approximately 0.81, 1.51 and 2.67 respectively. The researchers found that the abundance of carbon in HD 121447 is enhanced, while similar to that of the sun in the other two stars. When it comes to the abundance of nitrogen, the results show that it is enhanced in all the three stars. Furthermore, the abundance ratios of alpha elements of the studied stars, except for magnesium, are generally consistent with those of barium stars. Moreover, abundance ratios of iron peak elements in HD 51959 and HD 88035 are typical for those of normal giants and barium stars. Notably, the researchers conducted a kinematic analysis of the three stars. The results allowed them to exclude the possibility that HD 51959, HD 88035 and HD 121447 could be CH stars, and to confirm that all the three objects belong to the thin disk of the Milky Way galaxy. "From kinematic analysis all the three objects are found to be members of thin disk population with a high probability of 0.99, 0.99 and 0.92 for HD51959, HD88035 and HD121447 respectively," the scientists concluded. We present elemental abundance results from high resolution spectral analysis of three nitrogen-enhanced barium stars. The analysis is based on spectra obtained with the FEROS attached to 1.52m telescope at ESO, Chile. The spectral resolution is R~48000 and the spectral coverage spans from 3500-9000AA,. For the objects HD 51959 and HD 88035, we present the first time abundance analyses results. Although a few studies are available in literature on the object HD 121447, the results are significantly different from each other. We have therefore carried out a detailed chemical composition study for this object based on a high resolution spectrum with high S/N ratio, for a better understanding of the origin of the abundance patterns observed in this star. Stellar atmospheric parameters, the effective temperature, surface gravity, microturbulence and metallicity of the stars are determined from the LTE analysis using model atmospheres. The metallicity of HD 51959 and HD 88035 are found to be near-solar; they exhibit enhanced abundances of neutron-capture elements. HD 121447 is found to be moderately metal-poor with [Fe/H]=-0.65. While carbon is near-solar in the other two objects, HD 121447 shows carbon enhancement at a level, [C/Fe]=0.82. Neutron-capture elements are highly enhanced with [X/Fe]>2 (X: Ba, La, Pr, Nd, Sm) in this object. The alpha- and iron-peak elements show abundances very similar to field giants with the same metallicity. From kinematic analysis all the three objects are found to be members of thin disk population with a high probability of 0.99, 0.99 and 0.92 for HD 51959, HD 88035 and HD 121447 respectively.